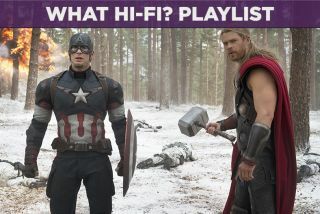 Avengers: Age of Ultron – film review | What Hi-Fi? Liked the first Avengers? You’ll love this too. It's not Marvel's best, but by Odin, it sure is fun. It’s that time again. The Avengers have had their solo adventures, and now they’ve reassembled to party. And what a party it is: Age of Ultron is as entertaining as it is ambitious, and a far more rounded offering than its predecessor. The real attraction is the team itself. This is a united band of misfits, now entirely at ease with one another and ready to have some fun. Jokes fly faster than arrows and hit just as hard. Joss Whedon's script is sharper than ever. But even before everyone rips into Captain America’s use of language, their rapport is unmistakable. Finally, the team feels balanced. Hawkeye is no longer an accessory. Iron Man doesn’t get to hog the spotlight, with the Cap acting as counterweight (and foreshadowing a fallout). Meanwhile, Black Widow and Hulk/Dr Banner get to do some emotional heavy-lifting. Throw in a few cameos and you’ve got yourself a family. Of course, bad things happen. The first Avengers assembled the team, but Age of Ultron is all about tearing them apart. It's the second-movie trope of going darker, which results in the most personal of Marvel's 11-strong franchise. New threats arrive. Ultron, a robotic manifestation of Iron Man’s mistakes (voiced with swagger by a charismatic James Spader). Quicksilver, he of lightning speeds. Scarlet Witch, whose mind-bending powers tear at the team’s guilts and fears. It is she who cuts the deepest. This is the first time we see the heroes properly vulnerable, and it is refreshing. As easy at it would be to enthuse all day, there are some issues. A few plot points are underdeveloped, no doubt because they are seeds for future exploits. Pacing is uneven towards the end, with the final chapter being yet another extended exercise in beating up a city. There is also a degree of assumed knowledge, although given the material this is hard to avoid. By now, Marvel could coast by, trading on the combined mega-wattage of all the big names on board. Instead, Age of Ultron is an ambitious project, undertaken with skill by writer-director Joss Whedon. If you liked the first Avengers, you’ll love this too. It may not be Marvel's best but, by Odin, it sure is fun. Avengers: Age of Ultron (12A, 141 minutes) is out now in cinemas across the UK. Go and see it in 2D.